090806-N-4605O -DJIBOUTI (Aug. 6, 2009) Soldiers from U.S. Army Central Command (ARCENT) coordinated a Combat Life Saver Seminar with Combined Joint Task Force Horn of Africa to demonstrated life saving skills with the Djiboutian Army. That’s only the beginning, not the end of the matter. For years, various reporters have shed light on hush-hush outposts — most of them built, upgraded, or expanded since 9/11 — dotting the continent, including so-called cooperative security locations (CSLs). Earlier this year, AFRICOM commander General David Rodriguez disclosed that there were actually 11 such sites. 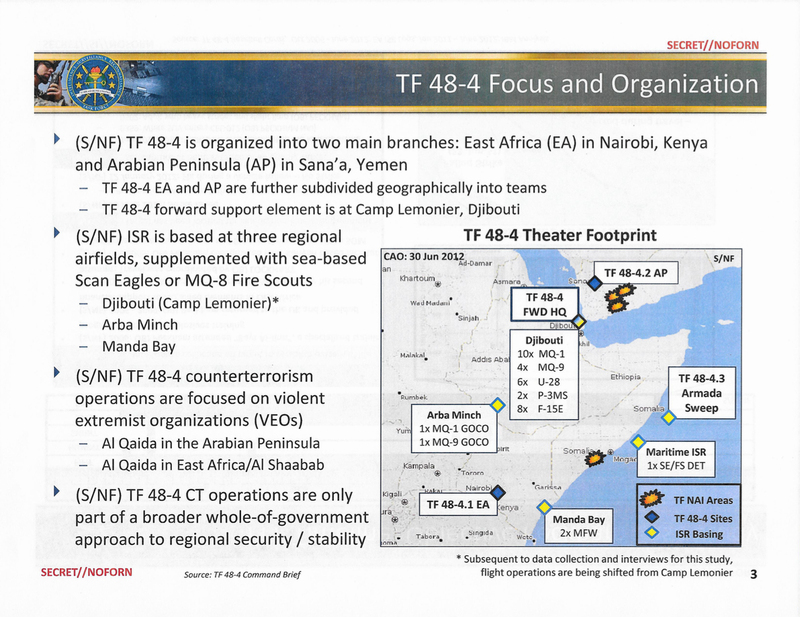 Again, devoted AFRICOM-watchers knew that this, too, was just the start of a larger story, but when I asked Africa Command for a list of bases, camps and other sites, as I periodically have done, I was treated like a sap. Research by TomDispatch indicates that in recent years the U.S. military has, in fact, developed a remarkably extensive network of more than 60 outposts and access points in Africa. Some are currently being utilized, some are held in reserve, and some may be shuttered. These bases, camps, compounds, port facilities, fuel bunkers, and other sites can be found in at least 34 countries — more than 60% of the nations on the continent — many of them corrupt repressive states with poor human rights records. The U.S. also operates “Offices of Security Cooperation and Defense Attaché Offices in approximately 38 [African] nations,” according to Falvo, and has struck close to 30 agreements to use international airports in Africa as refueling centers. Drones have played an increasingly large role in this post-9/11 build-up in Africa. MQ-1 Predators have, for instance, been based in Chad’s capital, N’Djamena, while their newer, larger, more far-ranging cousins, MQ-9 Reapers, have been flown out of Seychelles International Airport. As of June 2012, according to the Intercept, two contractor-operated drones, one Predator and one Reaper, were based in Arba Minch, Ethiopia, while a detachment with one Scan Eagle (a low-cost drone used by the Navy) and a remotely piloted helicopter known as an MQ-8 Fire Scout operated off the coast of East Africa. The U.S. also recently began setting up a base in Cameroon for unarmed Predators to be used in the battle against Boko Haram militants. On the other side of the continent in Somalia, elite U.S. forces are operating from small compounds in Kismayo and Baledogle, according to reporting byForeign Policy. Neighboring Ethiopia has similarly been a prime locale for American outposts, including Camp Gilbert in Dire Dawa, contingency operating locations at both Hurso and Bilate, and facilities used by a 40-man team based in Bara. So-called Combined Operations Fusion Centers were set up in the Democratic Republic of Congo and South Sudan as part of an effort to destroy Joseph Kony and his murderous Lord’s Resistance Army (LRA). Washington Post investigations have revealed that U.S. forces have also been based in Djema, Sam Ouandja, and Obo, in the Central African Republic as part of that effort. There has recently been new construction by Navy Seabees at Obo to increase the camp’s capacity as well as to install the infrastructure for a satellite dish. In addition to hosting a contingent of the Marines and sailors of Special-Purpose Marine Air-Ground Task Force Crisis Response-Africa, Sigonella Naval Air Station in Sicily, Italy, is another important logistics facility for African operations. The second-busiest military air station in Europe, Sigonella is a key hub for drones covering Africa, serving as a base for MQ-1 Predators and RQ-4B Global Hawk surveillance drones. Reprinted, with permission, from TomDispatch. Photo: U.S. army personnel in Djibouti. Previous Article← Is John Kerry an Anti-Semite?